Therapeutic horticulture has been used in a variety of settings with several populations to enhance psychological well-being. Past research has indicated benefits in many of these settings, but at present there is more anecdotal than empirical evidence. School gardens have proliferated in recent years. Coupled with the rise in school gardens is an abundance of Kindergarten through twelfth grade standards-based garden curricula approved by the California Department of Education. 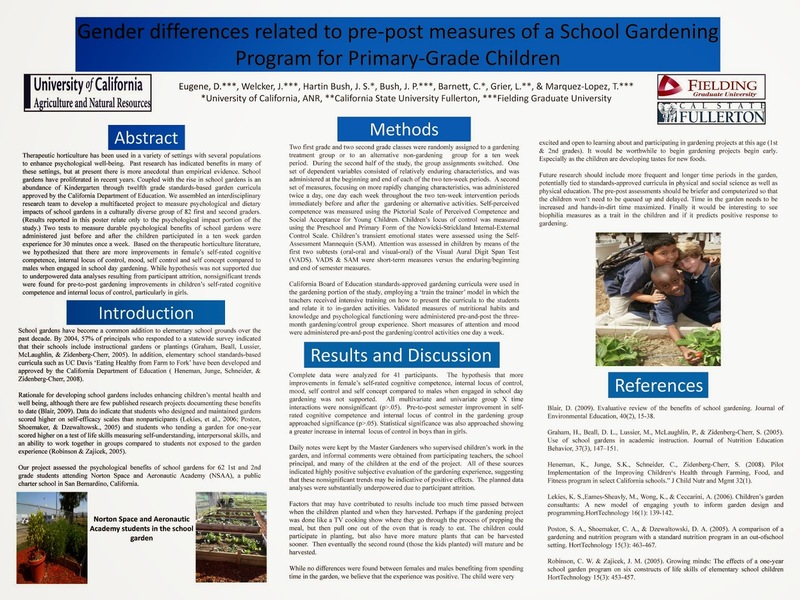 We assembled an interdisciplinary research team to develop a multifaceted project to measure psychological and dietary impacts of school gardens in a culturally diverse group of 82 first and second graders. (Results reported in this poster relate only to the psychological impact portion of the study.) Two tests to measure durable psychological benefits of school gardens were administered just before and after the children participated in a ten week garden experience for 30 minutes once a week. Based on the therapeutic horticulture literature, we hypothesized that there are more improvements in female’s self-rated cognitive competence, internal locus of control, mood, self-control and self-concept compared to males when engaged in school day gardening. While hypothesis was not supported due to underpowered data analyses resulting from participant attrition, nonsignificant trends were found for pre-to-post gardening improvements in children’s self-rated cognitive competence and internal locus of control, particularly in girls.